(AP) MEXICO CITY - Thousands of people rushed to stores Tuesday to redeem pre-paid gift cards they said were given to them previously by the party that won Mexico's presidency, inflaming accusations that the weekend election was marred by widespread vote-buying. Meanwhile, the projected runner-up in the election, Andres Manuel Lopez Obrador, said he has asked Mexico's Federal Election Institute for a recount of the ballots. The Election Insitute says it expects the final count results Sunday, and that the law will already likely mandate recounts of about a third of the total ballots cast. At least a few gift cardholders were angry, complaining that they didn't get as much as promised or that their cards weren't working. Neighbors at one store in a poor neighborhood on the outskirts of Mexico City said the unusually large crowds prevented them from doing their daily shopping. Some people shopping at the store said that they were told the cards would be valid only during the two days after Sunday's election and that they had waited to cash them in until Tuesday because the store was packed Monday. What new Mexican President Pena Nieto's election means for the U.S. Under Mexican election law, giving voters gifts is not a crime unless the gift is conditioned on a certain vote or meant to influence a vote. However, the cost of such gifts must be reported, and cannot exceed campaign spending limits. Violations are usually punished with fines, but generally aren't considered grounds for annulling an election. Some of the people lined up to use gift cards said they got them for supporting the Institutional Revolutionary Party, or PRI, whose Enrique Pena Nieto won Sunday's presidential election, according to the preliminary official vote count. Some wore red T-shirts and baseball caps or carried tote bags with Pena Nieto's name printed in white. Maria Salazar, a 20-year-old university student, came with her 70-year-old father, Antonio Salazar, to cash three cards. "They gave us the cards in the name of the PRI and Rep. Hector Pedroza (a PRI congressional candidate), and they said they were counting on our vote," Maria Salazar said outside one store, as she carried plastic shopping bags packed with toilet paper, cooking oil, rice, saltine crackers and instant noodle soups. Her father carried two more packed grocery bags and her 8-year-old nephew carried another. "They told us they were worth 500 pesos ($37.50), but when we got to the check-out, they were only worth 100 rotten pesos ($7.50)," Salazar said. Both she and her father said they had been told to turn in a photocopy of their voter ID card in order to get the gift cards. Another woman interviewed outside the same Soriana grocery store also complained that her card had only 100 pesos ($7.50) in credit. "For helping them with votes and all ... they gave us a card for supporting them, and all that for 100 pesos," said the woman, who gave only her first name, Josefina, for fear of reprisals. She said she got the card for supporting Pena Nieto, but complained that "100 pesos lasts you about five minutes." Inside the store, long lines formed at card-reading machines as people tried to find the balances on their cards. Some grew angry and shouted insults against Pena Nieto. Regular shoppers were vexed at the long lines. "I was going to buy bread right now, but you can see, the lines are tremendous, you can't even get in," said Maria Garcia Lobato. Pena Nieto's campaign and the PRI press office said they had no immediate comment. In the final days of the campaign before Sunday's vote, PRI officials denied allegations that the party had distributed pre-paid cash cards from a local bank. Humberto Fayad, a spokesman for the Soriana grocery store chain, denied the company sold huge amounts of gift cards to the PRI. "There is no agreement between the PRI and Soriana, or Soriana and any other political party. Soriana is a non-political company," Fayad said. Before the election, the PRI accused the conservative National Action Party, or PAN, whose candidate ran third in the presidential election, of passing out groceries during the campaign, and claimed the leftist Democratic Revolution Party, or PRD, had gotten illegal campaign financing. None of those allegations have been proven. 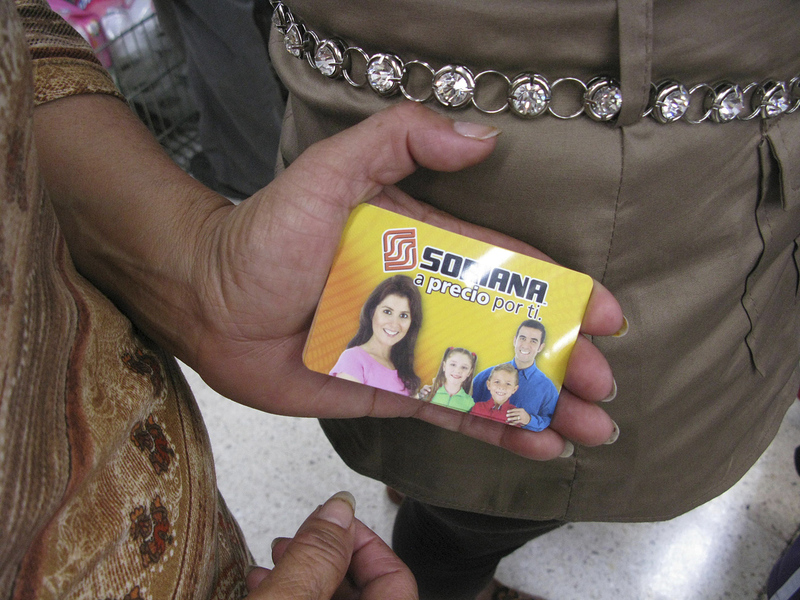 On the Friday before the vote, the PRD issued a statement accompanied by photos of dozens of the Soriana gift cards, saying they had been distributed by a PRI-affiliated union, and it filed a complaint to electoral authorities. The party's presidential candidate, Andres Manuel Lopez Obrador, came in second. Allegations of vote-buying were not limited to Mexico City, with complaints cropping up in several battleground states. PAN accused Pena Nieto's campaign of acquiring about 9,500 prepaid gift cards worth nearly $5.2 million (71 million pesos) to give away for votes. Authorities said a business had bought that number of cards, but had found no direct evidence of vote-buying. That investigation continues. On Tuesday, Alfredo Figueroa, a council member of the oversight agency known as the Federal Electoral Institute, said authorities were investigating complaints about the Soriana gift cards. Members of the institute have said they were aware of attempts to engage in vote buying. Figueroa also said that irregularities in vote tallies might eventually lead to the opening and re-counting of votes from as many as 50,000 polling stations, about a third of the 143,000 involved in Sunday's vote. Lopez Obrador said Tuesday that his team had detected irregularities at 113,855 polling places, and called for a total recount. "This is a scandal ... They bought millions of votes," Lopez Obrador said at a news conference, referring to the PRI. "Clearly, they far exceeded campaign spending limits ... this is a national embarrassment." Lopez Obrador has refused to accept the preliminary vote tallies, saying the election campaign was marred by overspending and favorable treatment for Pena Nieto by Mexico's semi-monopolized television industry. Many Mexicans also questioned why pre-election polls showed Pena Nieto with a double-digit lead, roughly twice the margin he really won by. With 99 percent of the vote tallied in the preliminary count, Lopez Obrador trailed by six percentage points. The narrower-than-expected margin has fueled suspicion among Lopez Obrador's followers about the fairness of the vote, and he refused Monday night to concede defeat, just as he did when he lost a razor-thin race in the 2006 presidential race and set off months of political unrest. This time, he has not called his followers into the streets to protest. Lopez Obrador argued from the start of the campaign that pollsters were manipulating surveys to promote the idea that the PRI candidate was far out in front. Pollsters deny that, saying they believe some voters switched to Lopez Obrador in the final week, a period when publication of new polls is banned by law. Lopez Obrador said he would not accept the preliminary election results reported by the Federal Electoral Institute and would wait until Wednesday, when the official results are to be announced, before deciding what he will do. "We will not accept a fraudulent result," Lopez Obrador said. Calls from conservative and pro-business groups mounted for Lopez Obrador to accept the results. "We hope that the leftist candidate ... will also adhere to legality and recognize the official results once the authorities issue a final result," the Mexican Employers' Confederation said in a statement.